Attend our bi-weekly meetings and pay your membership dues! Q: What kind of events do you have? Our events range from our Annual Meet & Greet, guest speakers, volunteer events, workshops, socials, Dental school field trips, and more! Q: What if I can't make it to meetings? That is no problem at all! You are more than welcome to attend our other events. Missing meeting does not dictate your ability to be apart of our organization, and we do our best to actively update our calendar and send out emails for those who cannot attend due to time conflicts. In undergrad, there are a many of obstacles that you do not need to face alone. 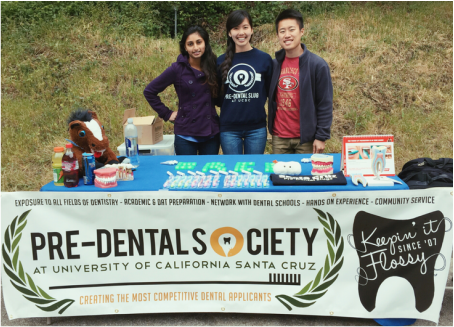 Pre-Dental Society at UCSC is an incredible support system that opens plenty of opportunities to: network with Alumni and other Pre-dents, strengthen your leadership skills and resume, increase your awareness and knowledge of Dentistry, and expand your abilities in becoming a stronger applicant! We encourage all individuals to come out and gain a deeper perspective on Dentistry. Whether or not you are decided, it will serve as a great opportunity to explore the field and see if it is a perfect suit for you. All in all, your personal growth from your undergrad experiences, and what you choose to commit yourself to will be dependent on the efforts you put forth. 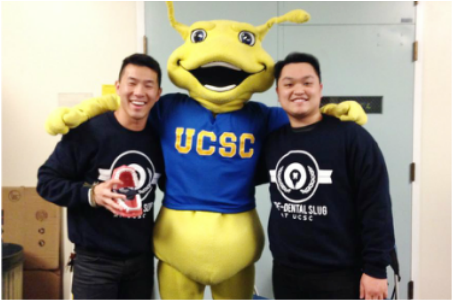 So come out and meet your fellow Pre-Dental slugs! 2) Oral and Maxillofacial Surgery: This field of dentistry focuses on surgeries performed in the mouth, face, and jaw. Reconstructive surgery and dental implants are included. 3) Oral and Maxillofacial Pathology: This field of dentistry concentrates on identifying and managing diseases affecting the oral and maxillofacial regions and investigating the causes, effects, and processes of those diseases. 4) Oral and Maxillofacial Radiation: In this field of dentistry, dentists examine x-rays to determine diseases in relation to the jaw, face and mouth. 5) Prosthodontics: This field of dentistry focuses on the creation of prosthetic models to treat anatomical dysfunctions in the mouth (i.e. dental crowns, dental implants, and dentures). 6) Orthodontics: In this field of dentistry, professionals focus on straightening their clients teeth using braces and/or retainers. 7) Periodontics: This field of dentistry achieving and keeping the health of a client's tooth structure. The tooth has usually decayed from gum tissue infections.